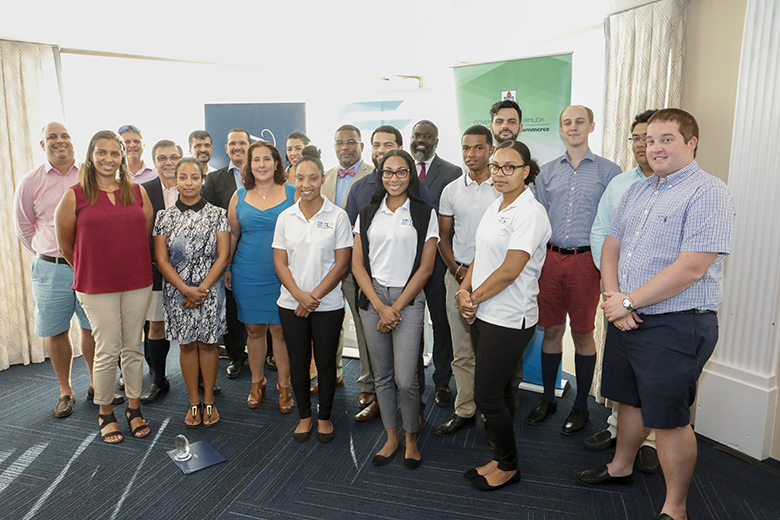 The Technology Leadership Forum [TLF] recently celebrated the completion of their Summer Internship Programme, with a ceremony held to recognize Matthew Correia, Justine Dzofonoo-Burch, Raven Duffy, Stephen Galloway, Sher-Kyra Ourterbridge, Stephen Outerbridge, Kiara Saunders and Jalesa Vincent. The ceremony was held at the Royal Hamilton Amateur Dingy Club, with family members and representatives from a variety of companies in attendance, with the certificates being presented by Minister of National Security Wayne Caines and Minister of Education & Workforce Development Diallo Rabain. The TLF Board, participating sponsors and mentors congratulated the students on a job well done. During the 12 intensive weeks of the programme, the Interns acquired experience in the ICT industry through classroom learning, fieldwork as interns at participating companies and a team project. This project required them to create a working application, develop a report and provide a presentation to the TLF Board and invited guests. The TLF was founded 11 years ago in response to a need for qualified Bermudian talent in the ICT field. The registered charity is run in partnership between the public sector, private technology companies and organizations. The TLF’s key objectives are to provide training, encourage dialogue, address challenges and propose action steps, mentor ICT students and young professionals, and to be a networking group amongst peers. The students receive training and the curriculum is designed by the TLF industry partners. Each year the courses are reviewed and modified to reflect the ever-changing ICT environment. This year blockchain training was added to the extensive curriculum which includes; modules in Business Continuity, Project Management, Information Security, Data Warehousing, Programming, and Networking. These modules were taught by industry professionals and intended to provide the students with a high-level overview of the topics. The TLF introduces modules that will encourage students to focus on areas of study which are presently the greatest need in Bermuda businesses. One of the benefits of this internship program is the networking opportunities available to the students and the local ICT partners. 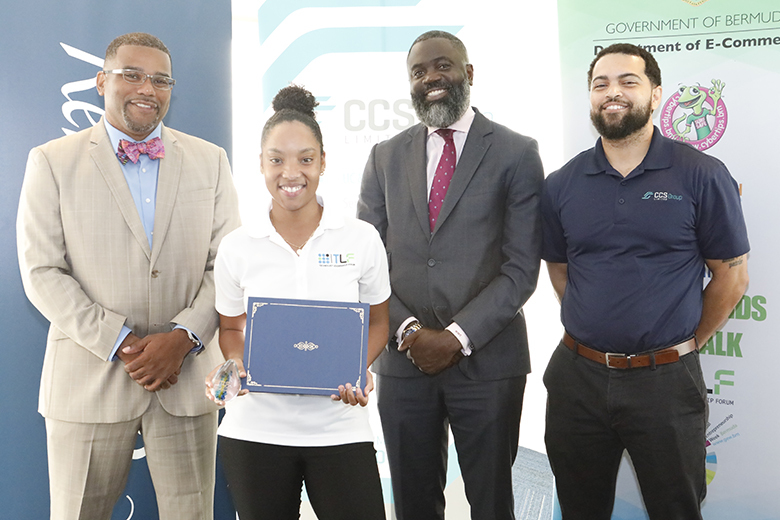 The TLF said, “Additionally, the partners know that students graduating from the program have the capability to become valued members of a company’s workforce. Three awards were presented during the evening; The Most Outstanding Student Award, The Most Improved Student Award and The Inspiring IT Professional Award. The Outstanding Student Award was presented to the intern who has made a positive, lasting impression on the TLF Board members and sponsoring companies during the programme, embodying the objectives of the TLF Internship Programme. This year the Outstanding Student Award was presented to Matthew Correia. The TLF also recognized an intern who made great strides during the programme, demonstrating that they had benefitted from the instruction and the opportunities provided to enhance their skills. While the intern’s performance is an important factor, the intern’s professionalism, networking skills and drive were also assessed. This year the TLF awarded Sher-Kyra Outerbridge the Most Improved Student Award. Each year the interns select an ICT professional who made an impact on the group by providing instruction, advice and counsel to enable them to move towards their career goals. In a programme where the interns are expected to go above and beyond, it is no surprise that the ICT professionals involved do so as well and more. This year, the Most Inspiring IT Professional Award was awarded to two professionals: Chris Phillips, who is a 2013 TLF Alumni and Coral Wells. TLF Board member Chris Phillips thanked the sponsors that continue to make the internship programme possible year after year, saying,“As a TLF Alumni, I personally know the benefits of programme. 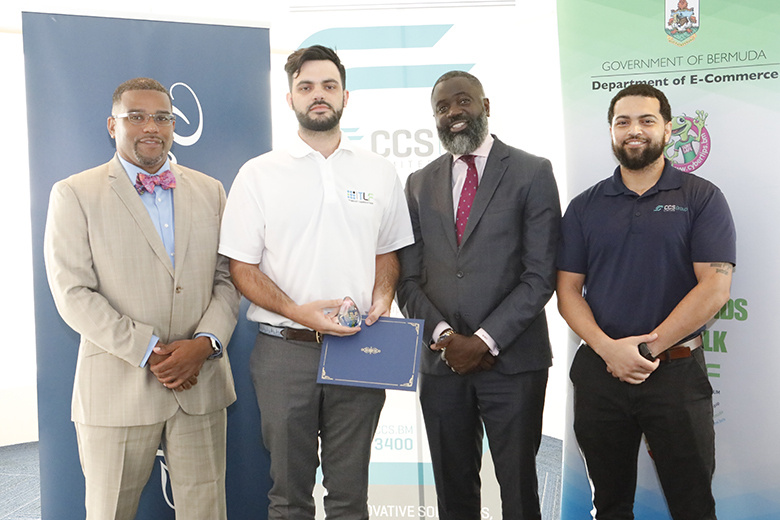 “The generosity and continued support from our sponsors make stories like mine a reality for our interns.” The 2018 TLF sponsors include: Validus Re, the Department of ICT Policy and Innovation, CCS Group, First Atlantic Commerce, Deloitte, W&W Solutions Ltd./Connectech, Ptix & Fireminds, Argo Group, Link Bermuda and RenaissanceRe. For more information on the Technology Leadership Forum Internship Programme, members of the public can visit www.TLF.bm.